Armed Forces Medical College (AFMC), Pune is one of the prestigious and ranked among the top medical colleges of India. Established in 1948, AFMC, Pune is known as a centre of excellence for education as well as for research. It is approved by Medical Council of India and is affiliated by Maharashtra University of Health Sciences. It includes four hospitals viz. Military Hospital (Cardio Thoracic Centre), Command Hospital (Southern Command), Military Hospital (Khadki) and Artificial Limb Hospital. The ‘Graduate Wing’ of AFMC, Pune was established in 1962. In 2017 AFMC, Pune is ranked 2nd by India Today and Outlook India and 3rd by The Week. 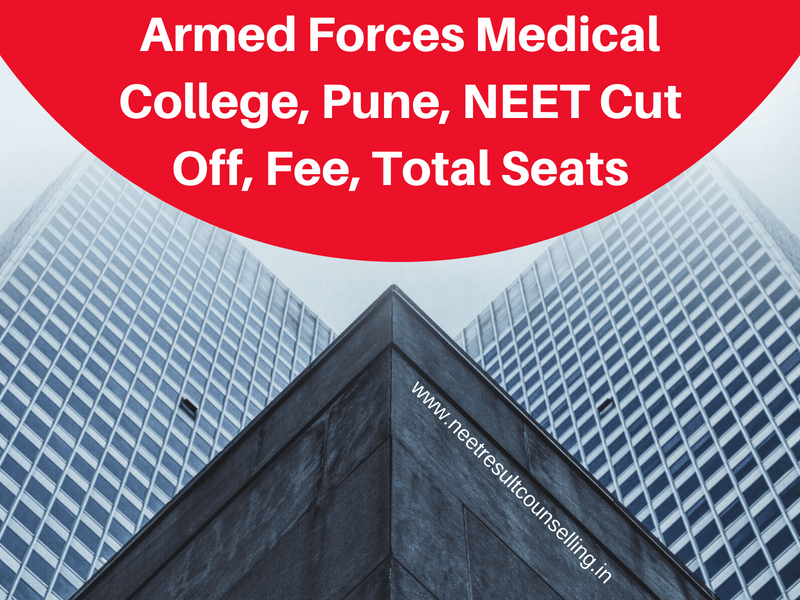 This article will provide all the necessary information related to the admission in Armed Forces Medical College, Pune. It will include details about course offered, total seats, fee structure, cut off marks, contact details etc. Note- Fee structure is based on previous year’s data and is subject to change as per the rules and policies of the university. There are total 140 seats sanctioned by MCI, India for MBBS. Out of the total seats, 105 seats are reserved for male candidates, 25 seats are for female candidates and 10 seats are reserved for SC/ST candidates. Apart from this, no reservation is provided to other backward classes (OBC) and to other categories. NEET candidates have to secure the minimum percentile (minimum Marks required) finalized by CBSE in order to qualify the exam and secure admission in a medical college. Admission in AFMC, Pune will also be granted on the basis of NEET scorecard. Category-wise qualifying percentile of NEET 2018 needed for admission in MBBS courses is given below. Let’s understand the meaning of cutoff marks and on what factor does it depends. Cut off marks are the minimum number of marks required to qualify an entrance exam. NEET cut off marks depends on the various factors such as- Total number of candidates appeared in the exam, the total number of candidates qualifying the exam, marking scheme, and the reservation provided to the candidates. AFMC, Pune grants admission to the candidates in MBBS on the basis of NEET scorecard. AFMC, Pune will release its MBBS merit list after the declaration of merit list of All India Quota and that will be followed by the counseling and Interview. AFMC Medical Counseling will be conducted probably in the 3rd week of July 2018. Apart from MBBS, admission in other courses like MD/MS/PG Diploma and DM/MCH is granted on the basis of NEET PG and NEET SS respectively.